Newman received his thirteenth Oscar nomination for Steven Spielberg’s Cold War drama. He has a decent chance of snagging the award, but is probably expecting it to go elsewhere, again. We also haven’t covered a Newman session yet, but hopefully that will change – and improve his chances next time! Burwell finally gets his first Oscar nomination, and his emotionally driven, intimate and minimalist (at times) score for Carol is certainly well deserved. We’ll have our coverage of Burwell’s The Finest Hours later this month. This is the second nomination for Jóhann Jóhannsson, after last year’s The Theory of Everything. Personally I thought the score for Sicario worked very well in the film, but isn’t the most enjoyable soundtrack album listen out there. We also haven’t covered any of Jóhannsson’s sessions yet, hopefully he’ll record in Los Angeles in the future. Surprising absolutely no one, legendary film composer John Williams snags his 50th(!) Academy Award nomination for the newest entry in the beloved sci-fi series. Fun fact: with the exception of two years (1986 for SpaceCamp and 2008 for Indiana Jones and the Kingdom of the Crystal Skull), Williams has received an Oscar nomination every single year that he wrote a film score since 1980. This also marks the first Star Wars music nomination for Williams since 1983’s Return of the Jedi; he was not nominated for any of the prequel films, but received nominations for other films he scored those years. As mentioned earlier this week, we’re still hoping to get a gallery of pix from The Force Awakens from Lucasfilm/Disney. Fingers crossed! The sixth Oscar nomination might be the one that finally gets Morricone the award (he was awarded an “honorary” Oscar in 2006, but hasn’t officially won in competition). The 87-year old Italian composer hasn’t recorded a film score in the USA in ages, which is why we have no coverage on the site, sadly. The Hateful Eight was recorded in Prague. 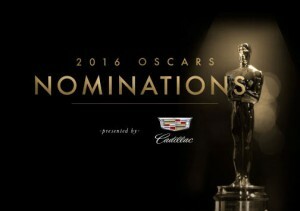 The Oscar winners will be announced on Sunday, February 28th.